NABISCO Sweepstakes: In April, celebrate Month of the Military Child with NABISCO and you could win $5,000 towards your child’s education. To enter, text “PURPLE” to 89884 or go online to NabiscoMilitaryMonth.com and register by April 30, 2019. 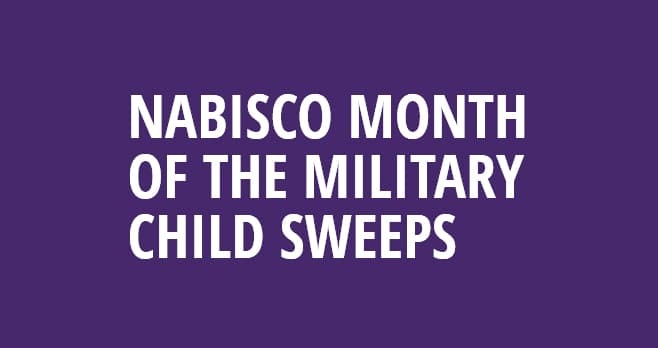 The NABISCO Month of the Military Child Sweepstakes is open only to residents of the 50 United States and D.C. and active duty U.S. military personnel and their families, stationed within U.S. or abroad, who are 18 years of age and older as of the time of entry. The Sweepstakes begins at 12:00 am ET on April 1, 2019 and ends at 11:59 pm ET on April 30, 2019. One (1) Sweepstakes entry, per email address/person/mobile phone number, per day during the Sweepstakes Period, regardless of method of entry. The grand prize consists of $5,000.00 check to be used for education, payable to winner only. Visit NabiscoMilitaryMonth.com to enter and see Official Rules for details.